This photo documents the Naval Hospital Beaufort staff of 1966. The hospital opened on 127 acres of land in Port Royal in 1949. Though located in Port Royal, its name reflects the hospital’s service to the greater Beaufort community. The land on which the hospital was built includes the site of Camp Saxton, a Civil War garrison once occupied by the first black regiment of the United States Army, the First South Carolina Volunteers. Camp Saxton had formerly been the John Joyner Smith plantation. On January 1, 2013, Beaufort celebrated the 150th anniversary of the reading of the Emancipation Proclamation at the Camp Saxton site under what is now known as the Proclamation Tree. The Emancipation Proclamation was read here by General Rufus Saxton on January 1, 1863. 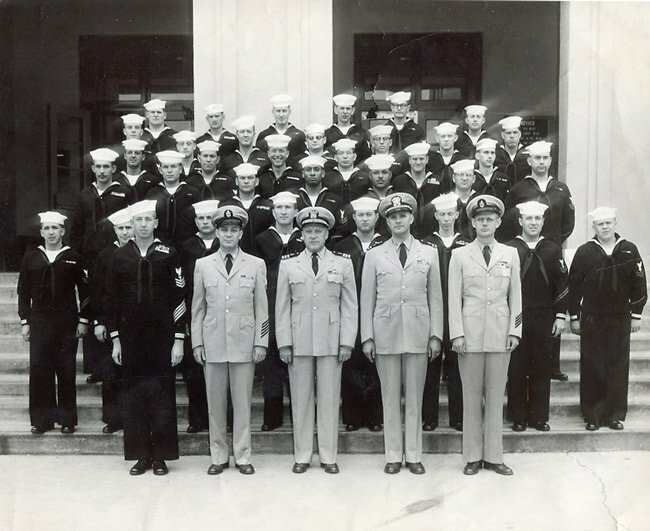 Today the National Historic Site shares space with United States Naval Hospital Beaufort, which provides medical care to all active Navy and Marine personnel, retired military personnel, and their families. The Camp Saxton Site is nationally significant as an intact portion of the camp occupied from early November 1862 to late January 1863 by the 1st South Carolina Volunteers, the first black regiment mustered into regular service in the United States Army during the Civil War, and as the site of the elaborate ceremonies held here on New Year’s Day 1863 which formally announced and celebrated the enactment of the Emancipation Proclamation freeing all slaves in areas then “in rebellion” against the United States. Throughout the summer of 1862 President Lincoln carefully considered the inclusion of blacks in the Union war effort, both in terms of the effect their emancipation could have on the Confederacy and in terms of the work they could perform as laborers and even soldiers in the U.S. Army. By August he was ready to implement a policy permitting his generals to use all the means at their disposal, including readily available black manpower, to help preserve the Union. On August 22nd Secretary of War Edwin M. Stanton authorized Rufus Saxton to “arm, equip, and receive into the service of the United States such volunteers of African descent as you may deem expedient, not exceeding 5,000.” The Camp Saxton Site is an approximately six-acre wooded and greenspaced site, bounded on the east by the Beaufort River, on the west by the complex at the United States Naval Hospital Beaufort, on the north by the boat basin off the Beaufort River and on the south by the ruins of Fort Frederick. My ancestor, Solomon Leibensperger was on the original expedition from Philadelphia to take Port Royal during the Civil War. Records at the Beaufort National Cemetery says he died of disease at the hospital. You can imagine the exhausting work to clear land for fortifications back then. Michelle, we would be absolutely thrilled to be able to add anything you send! This has been a longtime dream of ours. Please send anything you have to photos@sciway.net. Thank you so, so much! I may have some information and pictures regarding the original “Proclamation Tree” and the Historic Site Marker. Thank you, we have changed the location! Point of clarification, the hospital and historic sites are actually located in Port Royal, South Carolina. That is a very interesting bit of history. Thanks for sharing this information. I always enjoy learning new things about the history of our state.